How to draw barbarian warrior. This is partially digital art tutorial. As I mentioned earlier this year that I will try to sketch daily if I can. I try to make it happen everyday and spend more time drawing and painting all kind of things. Sometime I have to do some back end stuff of this art tutorial website or blog more often than I would like to. But to make a better experience for many to come take a look at all of our tutorials, I sort of have to. Anyway here is a remake of an old barbarian warrior sketch I did back in 2008, see “How to draw comics barbarian warrior.” As I look through all the thumbnails and search for the old drawing and painting tutorials that I think it has potential to turn out as a better painting or drawing piece. The old barbarian warrior sketch was another one of my choices. There are more than a few post that I pick out from the older drawing and repaint it. Quite a few of them turns out well such as Digital painting tutorial rogue samurai and draw and color anime girl step by step. This time I try to spend less amount of time and instead of turning it into a finish concept. I want to keep it remains somewhat unpolished and have the sketchy unfinished feel to it. This additional step by step tutorial is not totally a re-paint over, instead I use its essence and foundation to make it a better sketch and render than the old drawing. I basically just provide the old sketch the better lighting and tighten the shading on the existing drawing. Now I am slowly picking some of the old sketch, drawing or concept that are worthy of making a revamp. And perhaps if opportunity provide, I will take this one, once again, all the way to possibly finish painting stage. 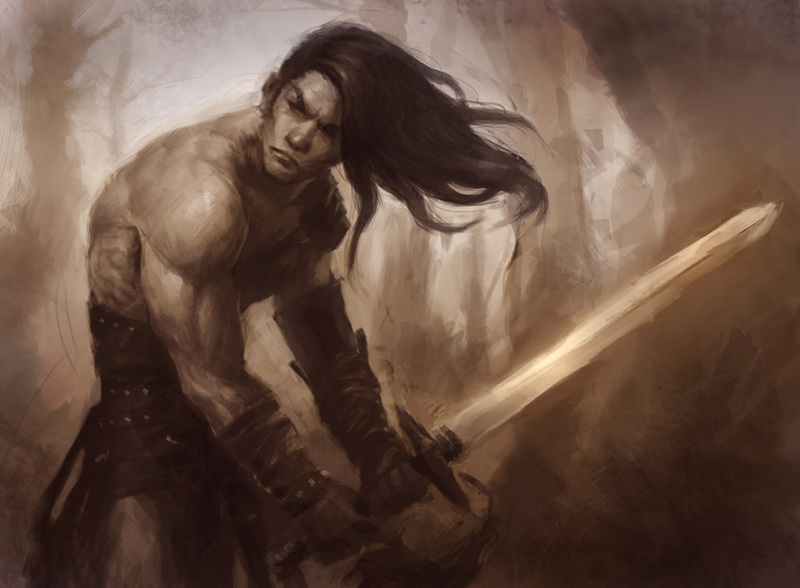 Watch the latest Video (2011) Conan the Barbarian digital painting video tutorial. Below are step by step process of how I paint over the barbarian warrior sketch. How to draw comics barbarian. Below is a drawing and painting process of a barbarian warrior. Also if you just want to take a look at some male basic anatomy video and step by step tutorials to supplement the barbarian tutorial above, Both Drawing body muscle torso anatomy video and Drawing arm muscles bicep tricep video are very useful as drawing and rendering muscles and human anatomy demonstration for artist. – Thor digital painting tutorial. – Environmental concept tutorial mountain and water.